Having published both the specifications for Roger Federer’s racquet and a photo comparison featuring his racquet and a retail version of the Wilson nSix-One Tour 90, I have been asked to do a playtest, presumably to see if hitting with his racquet reveals whether or not his frame is really “N-coded” with silicon dioxide nano-bits. It’s inconceivable to me that Wilson would go to all the trouble of designing the nSix-One Tour 90 for the world’s number one player, Roger Federer, and then leave out one of the key “ingredients” that in my opinion make it such a great racquet: the silicon dioxide. However, it has been proposed that I compare Federer’s racquet against not only the retail version of the nSix-One Tour 90, but also the Wilson Hyper Pro Staff Tour 90, and the Wilson Pro Staff Midsize (the 85 sq. in. racquet used by Pete Sampras, and presumably the racquet Federer first used, forming for him a model upon which to have Wilson build him a new racquet). The first step involved gathering together the test racquets, and stripping them down to a “bare” condition in which each had only the bumperguard, grommet strip, and leather grip. I then measured the specs on each racquet, using a Prince PTC, which I calibrated beforehand. The ambient temperature was 117° F, and the humidity was 15 percent. * This racquet has about .5 grams of lead tape in the hoop. The next step was to outfit each racquet with Wilson Reaction 16 (strung to the center of the recommended tension range — 55 pounds), and a Wilson Pro Overgrip. This means that I did not use the string and tension used by Federer, nor did I use leather power pads at the throat, as Federer does. I strung all racquets on a Tecnifibre SP Pro Cord (electronic, constant-pull), on which I checked calibration before and after each racquet (the Babolat Star 5 I have been using is on its way to the WTA tournament in La Costa for the Acura Classic). As usual, the calibration was perfect. The SP Pro Cord’s pulling program has a built-in pre-stretch that cannot be turned off, but it seems to be in the range of four to five percent of the reference tension. I also checked and adjusted the clamps before stringing each racquet. I strung each racquet using an around-the-world (ATW) “box” pattern, which minimizes the amount of string on the outside of the frame. When weaving the final cross, I used Sam Chen’s technique for a hard weave of natural gut. I gave the tied-off strings an extra four pounds of tension to compensate for tension loss during knotting. Before dismounting the racquet, I used an offset awl to straighten the strings. Each racquet dismounted with no discernable binding on the mounting billiards. The ambient temperature during stringing was 88° F, and the relative humidity was 30 percent. Immediately after stringing, I measured the stringbed tension of each racquet on an ERT 700, and the rest of the specs on the Prince PTC, which I recalibrated prior to taking measurements. * This racquet has a total of about 2 inches of ¼-inch lead tape in the hoop at 3 and 9 o'clock, put there to match its weight, balance, and swingweight to my two other Wilson nSix-One Tour 90s. Although I had noticed the spacing differences between the retail and Federer versions of the nSix-One Tour 90, they really hit home during stringing. The grommet holes for the Federer version do not conflict as much with the side supports on the SP Pro Cord, and there is plenty of space for the tie-off knot for the crosses. I can’t explain the lower swing weight of our retail nSix-One Tour 90, as illustrated in this table. Because it is a bit shorter than 27 inches, I tried mounting it 1/8-inches out on the Prince PTC machine, but gained only 3 kg•cm². These are not measurement discrepancies, as I double-checked the specs on the USRSA’s sample racquet on its Babolat RDC (Racquet Diagnostic Center), and I happen to know that Tennis Warehouse has calibrated its Babolat RDC, which is the source of its racquet specifications. Therefore, the measurements from the USRSA’s Babolat RDC and Tennis Warehouse’s Babolat RDC should be in accordance with each other, with the caveat that Tennis Warehouse uses points for expressing balance rather than centimeters. Because points are less accurate than decimal centimeters, the conversion from points to centimeters could account for the small divergence in the balance measurements. Therefore, the published specs for the retail nSix-One Tour 90 are almost certainly accurate. As for the test racquet, however, I can’t say for certain that it is “off-the-shelf,” as Wilson might have had its Pro Room prepare these racquets before sending them to me, and Ron Rocchi knows I like a more head-light racquet from our discussions of the Hyper Pro Staff ROKs that he made for me a couple years ago (thanks again, Ron!). * This racquet has about 2 inches of ¼-inch lead tape in the hoop at 3 and 9 o'clock, and 12 inches of ¼-inch lead tape in the hoop at 12 o'clock. The first play tester was Kimo, a 4.0 player who currently uses the Wilson Hyper Pro Staff Tour 90, although he started playing with the Wilson Pro Staff Original 6.0 85, and he switches back and forth between the two styles of frame. A few months back, he extensively demoed one of my nSix-One Tour 90s, but decided to stay with his current frames. He’s aware of some of the new racquet technologies, but is more interested in playing tennis than worrying about equipment. Kimo typically hits with nice topspin on his forehand and serve, and can hit some topspin on his backhand, but sometimes improvises. His volleys are adequate. A fitness instructor, his physical conditioning, speed, and agility are excellent. I opened a new can of Wilson Titaniums, and Kimo played ten to fifteen minutes with each of the frames. Because he always uses a string dampener, he used one throughout the session. Here are his comments, based on notes I took at the time of the play test. Kimo’s input: Loves this racquet, even though he’s switched to the Hyper Pro Staff Tour 90 for most of his playing. Feels he has the best control with this racquet. Feels confident in his backhand slice, which isn’t the case with the other frames. Still, it’s tiring to use this racquet because he has to bring his own power. He’s conscious of the small size of the head. My observations: Kimo struggled at first to get the range with this racquet, but then seemed to be doing fine. His serve was very consistent. Kimo’s input: More power than the Pro Staff Midsize, but his backhand slice pops up more, making it less effective. Felt most at ease with this racquet because it’s the one he’s been using most for the last year and a half or so, since switching from the Pro Staff Original 6.0 85. My observations: Kimo played about the way he normally plays with this racquet, even though he has me string his racquets with Luxilon Alu Power 16L at 55 pounds, and the difference in strings seemed to be throwing him off. Kimo’s input: Felt stiffer to him than the Hyper Pro Staff Tour 90. Doesn’t feel as if he has as much control. Didn’t feel he was able to adjust to the larger grip size. My observations: Kimo’s forehand seemed better with this racquet than with his daily racquet, and he hit some great volleys. After acclimating to the feel of the racquet, he hit his normal topspin serve, and then blasted some flat serves that I've never seen him hit before. Kimo’s input: Felt better than the retail version because the grip size is smaller. However, it has a “dead” feeling to it, similar to the retail nSix-One Tour 90. He still prefers the Pro Staff Midsize and the Hyper Pro Staff Tour 90, if on no other basis than the way the racquet feels. My observations: Kimo was hitting well off both sides with this racquet from the moment he picked it up. As with the retail nSix-One Tour 90, he hit some fantastic volleys. However, he couldn’t get a serve in to save his life. That just goes to show that feeling comfortable with a racquet isn’t the same as playing well with a racquet. Our second play tester was Rick, is a 4.5 player who has been playing for years. He, too, used to use the Pro Staff Midsize, so he is quite familiar with that racquet. Up until about a year ago, he was using a Prince Graphite II mid, but after hitting with my nSix-One Tour 90s, he had to switch. Rick isn’t one of those who is always on the look-out for the latest and greatest, but he does keep his ears open, and is willing to experiment with anything he thinks might help his game. In fact, he just switched strings from a premium multifilament to Luxilon Big Banger Original 16, which he now loves. Rick can hit with some topspin off both wings, but he is strongest near the net, where his volley, anticipation, and movement can be deadly. He has a deceptively smooth service motion that delivers a serve with punch and placement, and he can kick it up on you when he wants to. As you might guess from his service motion, he has a great overhead, and is able to get back quickly to cover lobs. Rick normally uses one of the bar-style Wilson dampeners that comes stock with the nSix-One Tour 90, but he did not use a dampener during the playtest. I opened a new can of Wilson Titaniums, and Rick played ten minutes with each of the frames. He then went back to the first frame, and hit with each of them again. Here are his comments, based on notes I took at the time of the play test. Rick’s input: Loves this racquet, even though he switched to the nSix-One Tour 90 last summer. Feels he has the best control with this racquet. This racquet still feels great to him. My observations: Rick hardly missed a shot with this racquet. Everything was going in — groundstrokes, volleys, serves — but without a lot of pace. Rick’s input: More power than the Pro Staff Midsize, but not as much control. Feels there is less stability, too. Doesn’t like this racquet. My observations: Rick was clearly out of his comfort zone with this racquet. He hit okay with it, but he seemed to be second-guessing himself. Rick’s input: Rick felt very comfortable with this racquet. He says that not only does it have the control of his Pro Staff Midsize and the power of the Hyper Pro Staff Tour 90, it also has less vibration. My observations: Rick was effortlessly hitting groundstrokes and serves that had some real pace on them. Rick’s input: Doesn’t like the smaller grip size. Has the same dampened feeling as the retail version. At first, he felt no difference between this racquet and the retail version, but then he could feel a difference, even though he had a difficult time describing it. My observations: Rick hit well with this racquet, too, but made a few more errors than with the retail version. I was the third play tester. I am a 4.0-4.5 player with modern-style strokes, meaning I normally hit topspin of both wings, but I'm trying to perfect my slice for return of serve and volleying. My day-to-day racquet is the Yonex RDX 500 HD, which I string with either Wilson Reaction 16 or Pacific ToughGut 16L (when I can get it) at 65 pounds. However, I try to play with a lot of racquets, and in the last three or four weeks I've used the Völkl DNX 10 mid (with Völkl Power-Fibre) and DNX 9 (also with Völkl Power-Fibre), the Prince O3 Tour mid (one with Pacific X-Force 18, one with Prince Premier 16, and one with Tecnifibre Pro RedCode 16), the HEAD Flexpoint Prestige mid (three different weights, balances, and swingweights, with HEAD FXP 16), and even a Prince Graphite Classic OS (with HEAD RIP Control). I try to play tennis five days a week. I can see why so many others like this racquet. This is only the fourth of the Pro Staff Midsize family with which I've ever hit, and each of the first three felt as if it had a spring-loaded hinge in the shaft area, giving it a horrible-feeling flex on impact. This racquet doesn’t have that feeling — just the normal vibration you feel in a racquet. As nice as it feels, the stringbed doesn’t have the proportional spacing of the later Wilson Pro Staff racquets, and sometimes my shots just took off. Volleying a sinking ball below net level required me to let a little air out of the ball to prevent it from flying past the baseline. Each of my serves went in, but with a lot less pop than I'm used to. Too much power on some shots, not as much on others: It would take me awhile to figure out this racquet, if I ever could. Just to check that I wasn’t hallucinating about the feeling of the other Pro Staffs, I took along one of Pete Sampras’ St. Vincent Pro Staff Midsizes and hit with it afterward. It gave me that same weird sensation I remembered from years ago, which is to say that it felt different from the Pro Staff Midsize used in our tests. More power than the Pro Staff Midsize, and about the same vibration. I have a kind of crush on this racquet because I really like the graphics. I don’t feel as though I hit particularly well with it, unfortunately. Now this is a racquet! It has a solid feeling that goes beyond the dampening of vibrations. In particular, I felt as if I was in total control of my volleys. Has the same dampened feeling as the retail version. However — and this is difficult to describe — there’s a lighter feeling to shots coming off of the upper part of the stringbed. It’s almost an airy feeling as the ball comes off the strings, and at first it leads to a kind of euphoria, but then you realize you're simply not hitting as well as with the retail nSix-One Tour 90, no matter what the sensations are. I attribute this difference in feeling (compared to the retail nSix-One Tour 90) to the difference in spacing of the cross strings. I am now convinced that the racquet Wilson designed for Roger Federer turned into the nSix-One Tour 90. My guess is that Wilson first got the racquet exactly right for Federer, and then modified it so the rest of us could better play with it. The retail and Federer version have the same dimensions, the same specs, and the same dampened feeling. On court the Federer version feels as close to the retail version as the specs indicate it will. The Federer version may be better for the way Federer hits the ball — and where on the stringbed he normally hits the ball — but for me, the spacing of the cross strings on the retail version get this racquet much closer to the feeling and results I expect. 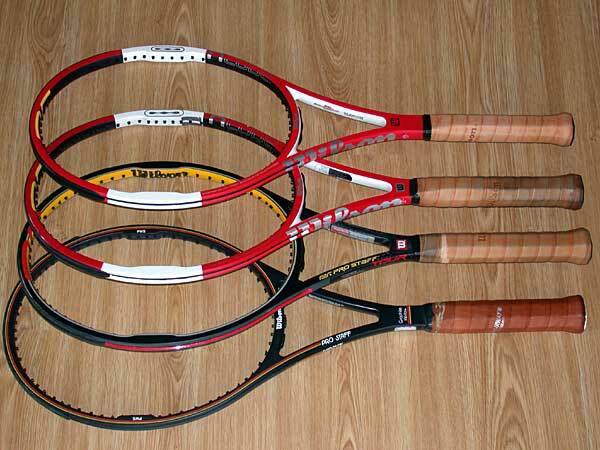 Each of us could tell that these four racquets are from the same “family.” There are definite similarities. I was skeptical about the value of including the Pro Staff Midsize in the test sample, but the one we tested felt as though it belonged there. As to the Federer racquet, my speculation is that Wilson hand-selects “hairpins” (molded frames that have yet to be drilled or have the pallet and buttcap attached) for Federer from the nSix-One Tour 90 production line, and then custom-drills and finishes them for Federer. That is, I do not believe that Wilson makes these racquets from scratch for Federer in the Pro Room. Thus, even though the type of customization done on Federer’s racquet can only be done by someone with a high level of competence and ability in racquet fabrication, Federer is essentially playing with a modified version of the same racquet that is available at retail to the rest of us. Thanks to Wilson Racquet Sports for supplying the strings and grips used in this playtest, Dave Bone of the USRSA for supplying the Federer version of the nSix-One Tour 90, Rick Golden for supplying the Pro Staff Midsize, and Kimo Tandaguen for supplying the Hyper Pro Staff Tour 90. Thanks also to Rick and Kimo for spending time playtesting the racquets. Without this help, the initiation and completion of this project would have been highly unlikely.